Yes I could use some new/sharpe knives – I am still using the ones I had in my hope chest so long ago, over 39 years now. And my Aunt always complains about how bad they are. Yes, I need new knives very badly! Dull isn’t the word for the ones I have! I am using the knifes we received fora wedding gift almot 24 years ago. I could sure use a new set. Yes & yes! I need a new set so badly. Yes, we need new knives badly! We have the same set we got when we were married, 8 years ago. It was a cheap set, so it could have been replaced 6 years ago! I sure do need some new knives. Mine are about 15 years old and are dull. Yes, yes, yes, new knives please. yes, we’ve got these old terrible knives and desperately need new ones! I keep my knives fairly sharp – I just bought some cutting gloves. I do have a couple I need to replace. I have never used knives like this though – they are awfully pretty. Yes, I need knives. I do not have many and some do need sharping, but I always forget to have them sharpened. Yes I could use some new sharp knives! I like the pretty colors of these knives! MOST DIFFENTILY NEED SOME KNIVES–JUST MOVED INTO MY OWN APARTMENT AND ITS A LITTLE SHORT ON KNIVES…. I suffer from no knives syndrome! I’ve been out on my own for a few years, but I haven’t purchased a good set of knives yet, save for the three-set I got five years ago. Yes, I need new knives. I suffer from dull bread knife kitchen syndrome. I really need new knives. My cousin gave me her old set when I was first married….19 years ago! I desperately need new knives. My knives are VERY dull. Do you need new knives? as a matter of sharp fact…I DO! I really need new knives! I was just complaining to my husband the other night about our knives! We just bought them like 6 months ago. They werent the most expensive available, but they weren’t the cheapest by any means…and already they are dull!! So irritating! These would be super~my knifes are way old! I only have a few good knives. Every knife we own is dull.Peeling potatoes is the worst! The kitchen knives I have are terrible. They are very dull and I only have one that I can cut meat with. My son needs knives. I’d like these for him. I really need new knives! All of mine but one I got used and they are not sharp at all! I do need some new knives. Thank you for the chance! I need these badly LOL! Ive heard great things about them…Thanks! Oh yes I do need these knives, don’t have good ones. Ive heard great things about them! I sure do need new knives, mine are terrible. I need more knives. I have just a few and they really need replaced. Yes I do have some dull knives…but I’d love these as a housewarming gift for a friend. As a matter of fact, I do need new knives! I really do need new knives. I was just shopping for some on Friday but they are expensive! I can never have too many knives! And I have always wanted pretty colored ones. Yes I need new Knives. I was trying to cut potatoes yesterday and realized how dull my knives have become. yes I need new knives, mine don’t stay sharp very long. We definitely need new knives! I would love to have some good knives. I tend to use the same one for everything, so variety would be nice. I have needed new knives for the longest time! My knives are so dull! I definitely need new knives. Yes, I have dull knives. Maybe one really sharp one. Yes, we really need new cutting knifes! Yes! Not joking, I was cutting potatoes the other day and it was like sawing through a log. My sister laughed and said I needed some good knifes because they would slice right through it! I’ve had dull knives my entire life! I am so used to have to saw away everything! I definitely need new knives! The ones I have were great for the first 2 years but they are almost 9 years old!! And they are definitely not as pretty! Yes, I do suffer from dull kitchen knife syndrome! I have a lot of dull knives and one good sharp knife. I’d love to be able to toss all the dull knives and replace them. Oh absolutely! Seems like a life long journey to finding the perfect knife! I love cooking for my wife during the weekends. Dull knifes make it no fun though, hoping ! could win this pair! I need new knives some of mine are about 20 years old and are just junk!! Yep…the majority of my knives are dull. Definitely! We haven’t gotten new knives in years and these are pretty too! Nonstick Bread Knife, 7″ would make my life easier. My knives are getting elderly, so I could definitely use some new ones. I love the colors on these! Yes I suffer from dull knife syndrome. I could use a new set of sharp knives. I’ve had the same set of knives for many years. Although I had them sharpened recently, they’re definitely not as sharp as I’d like. I also love the way these knives look – the colors are fun. 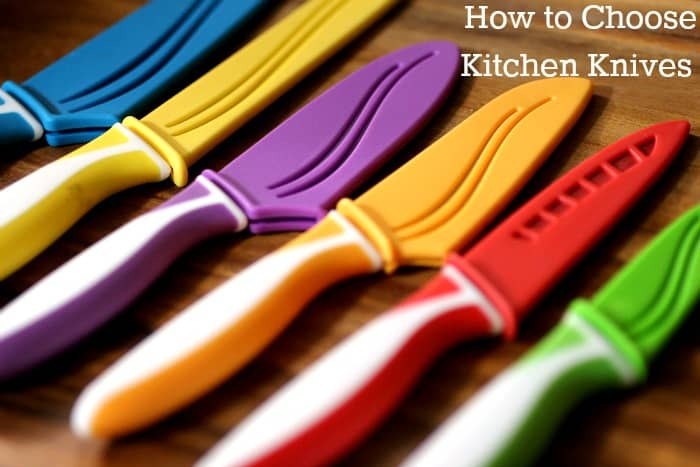 Why don’t I throw away all those dull knives in the knife drawer? Really, I’m asking. Why? I never use them, but I sure could use the drawer space. I used to , they were so bad, I got some new ones for Christmas a few years back. My knives were a wedding gift in 1980…need I say more? I definitely could use some new knives! My are getting pretty dull! Mine are so dull that the dog sits and waits for my dull cuts to go flying onto the floor! Been using old knives for the longest time and they haven’t been sharpened so probably not the safest things around. Would love to win this colorful and practical set! I have one good chef’s knife, but that’s it, so I do need good knives of other styles: bread knife, paring knife, etc. Yes and yes! 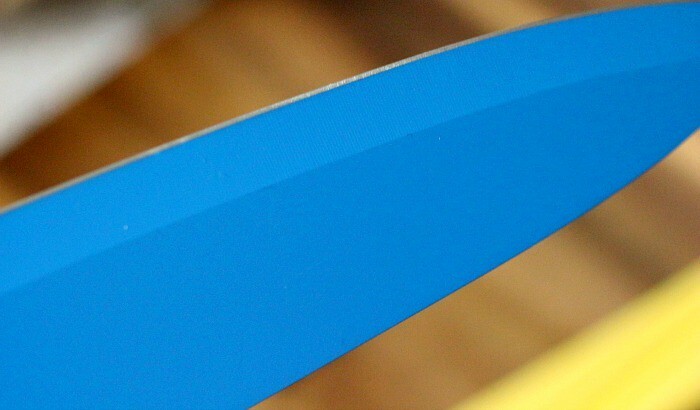 Our knives are frustratingly dull! Doesn’t everybody? Knives are hard to keep sharp! I totally need new knives. All of mine are from the thrift store! I could use a few different knives and I could use a few of the ones I have to be sharpened. I once had nice knives, but then I got divorced and he got the knives. That was 13 years ago. I would LOVE to have these awesome knives. Thank you so much for the opportunity to win them. I def need a nice new knife set. I have dull mismatched knives and it’s like chopping wood to cut anything. I love to bake and cook but my knives…well they are awful…these are even pretty. Thanks for the chance. I need some sharp knives ~ mine won’t hold a sharpen! I could really use a good set of kitchen knives, plus I’m never sure which types to buy. Oh yes, my knives are so old! Actually were a wedding present back in 1991! We need knives so bad,at Easter my son went to get one out of the block and the handle fell off. The worst is trying to prepare fruit and the knives are so dull that I squeeze out all the juices…I need new knives like you wouldn’t believe as I am always having a hard time preparing dinner for the family due to a dull knife, I’m just glad I haven’t seriously injured myself yet. I am redoing my kitchen and was just thinking how awesome it would be to start off with knives that are actually sharp. I love these knives and how well made they are! I desperately need a new knife set. Ours are really dull and quite old. all i have is cheap dull knives, i can never splurge on good knives, so this would be really great to win! Yes, our knives are dull! We definitely need new knives. The only ones we have now are Wal-Mart cheapos and some secondhand ones. I definitely need new knives, I have to sharpen mine each time before using them and even then they are not that sharp. I definitely need some new knives. I have been married 47 years so all my kitchen utinsils are really in bad shape. I would love to win these. Yes I do need new knives because mine are cheap and dull! I REALLY COULD USE SOME NEW KNIVES, ESPECIALLY THE BREAD KNIFE. you bet i need new knives!!!! I am in desperate need of new kitchen knives. I could definitely use new knives, especially with canning season coming up! I need some new knives in a bad way! Mine are horrible! I definitely need new knives, my knife set is very dull. I really need a good knife set, mine are all different and dull. I can get by with the knives I have (sure wish I knew how to use my Dad’s steel & stone, tho). I’m hoping to win these knives for my daughter. Thanks for the giveaway. I have many dull knives. I do need new knives. Mine are horrible! My knives are really old & I could use a matching set! I do need new knives! I have so many hand me downs, haha. I def need some new knives. Though I have not tried their knives, I do have a couple of their products and just love them! I don’t know if I *NEED* a Santoku knife. I’ve never used one, but I’ve been curious about how they work. Sure would like to try a nice nonstick one! if i had some new knives –I would be a happy kniver!!!! Sharp knives? I don’t know… might hurt myself with them. Love the colors and the non-stickness of them. I have some knives that aren’t really good for anything but, to look at. They look like good knives but not so much. Dull knife kitchen syndrome is putting it mildly — I can’t find half my knives! Yuppers, I need ’em! OMG ~ pls ~ pls giveaway fairies I have dull knife syndrome! After just trying three different knives before I found one sharp enough to slice a tomato, I think it’s fair to say that yes, I do need new knives! Just got their kitchen shears and they are some of, if not the best, I have ever used! But I still need knives! I do Suffer from dull knife kitchen syndrome! I do need new knives! I like most of the knives in the set that I have, but some of them just aren’t necessary for an everyday cook. O yes, we suffer from dull knifves hoping to win these fabulous ones. Thank you for the chance to win. I suffer from dull kitchen knife syndrome. I was going to donate my old knives, but why should I pass my crappy dull knives on to someone else? Win or lose, I need to toss my old knives. Save me from the shame of my Big Lots knife set. Help!!!!! I’d like a knife that cuts bread, not just makes crumbs. Yes we have some dull knives. Yes, I have dull knives. Probably, only one real sharp one. We need some new knives. I really want a new knife!! we have a problem here –DULL KNIVES SYNDROME!!!! I’d love new knives! Mine are always dull and are so cheap, they aren’t even hardly worth sharpening! I didn’t realize “dull knife kitchen syndrome” was a recognized affliction, but yes, I suffer from it! I need new knives, especially a new paring knife. My current ones are dull. Yes, I could use some new shoes. I sure could use some new knives! Mine are really dull. Yes! My knives are terrible and I need new ones! I could use a new set of knives! 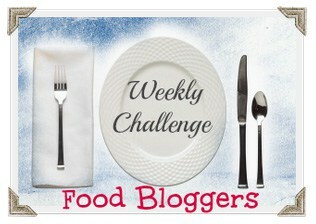 MY 2 KNIVES ARE SO DULL–I CANT CUT BOLOGNA WITH THEM–ITS TIME TO WIN THESE…. I have knives but they are all dull as butter knives! Yes, my knives are so dull! I have one good knife I use for just about everything. I could use some more. I hate dull knives so yes, I need NEW knives like these! I love the bright colors! I sure could use some sharp knives! My knives are suffering dullness and I could really use new ones. We definitely need new knives – very dull and cheap. 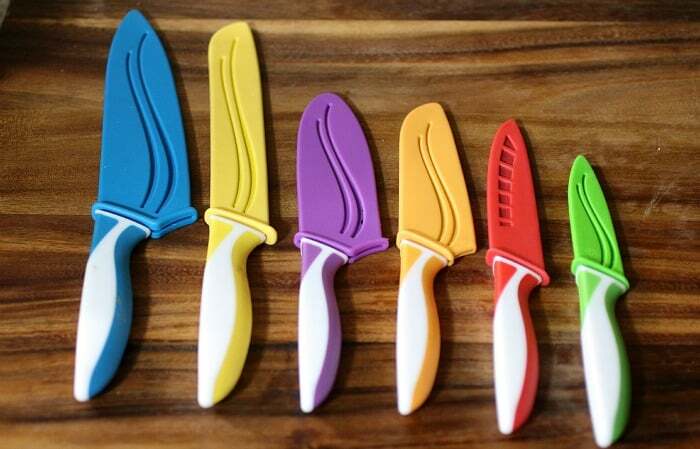 We have dull knives…and none this colorful! I have dull knives, I would love this set! I really do need new knives. My current ones were a cheap set bought 13 years ago. i got it–the dull knives syndrome. yes i need new knives. i only have one cutting knife and the rest are butter knives. I’m more apt to cut myself with a dull knife that slips. I had bought two Henckels knives years ago and both are ruined. One someone! used as a tool and broke the tip. Yes I need new knives. I love the colors of these knives. I could definitely use new knives. I bought a new set last year and my husband put them in the dishwasher last month and ruined them. We do have a few good knives… but most are terrible! We could definitely use some new ones. I need new knifes badly! Actually, I only own like….two knives, and they are good for nothing! Thanks for the giveaway…we have one decent knife left from an old set we inherited but it’s cracked & worn wooden handle won’t stay on much longer ! My husband is always ragging me about my dull knives! I’m afraid to sharpen knives, so most of mine are dull. pinned the picture, but not from your link b/c it didn’t work. Thanks! Yes, I need new knives. Mine are getting dull! I really do need new knives! My knife set was great 40 years ago! Have had them resharpened, but would love to have a new set. yes we need new knives, all of our current knives are dull and in terrible shape! Yes, I do need new knives. I have a random mixed match set of knives and never got brand new ones. These would be amazing! Who could have too many knives? Yes, I am ashamed to say I do suffer from dull knife syndrome. I said it…. Yeah, all my knives are so dull but then they are as old as I am so I should not complain. I definitely suffer from dull knife syndrome!!! This set is really cool, I love the colors. I do need new knives.I don’t think any of mine would cut butter. This giveaway ends tonight, so this is my last chance to say: Yes! I need new knives. And Yes! I suffer from dull kitchen knife syndrome.